Between the M42 and the M50. And no, it's not the M5! Oh, right. Another unbuilt motorway then? Yes, that's about the long and short of it. The Strensham - Solihull Motorway had a lifespan of about 5 years between conception and funeral. During that time it barely seemed to sit still! Despite all that, it was never allocated a motorway number, and indeed it presents an interesting numbering conundrum, which we'll return to later. OK, I'm thinking here. Men on the moon and all that. Yes, that's the right time frame. By the end of the 1960s, the Government was getting very close to the "1,000 mile target", of having 1,000 miles of motorway open by 1970, or only 12 years after the first motorway opened in 1958. Things were going rather well on the roadbuilding side of things, and thoughts turned to the next thousand miles of motorway, which the Government of the day pledged would be built by 1980. The second 1,000 miles actually arrived twenty years later than promised - when the eastern side of the M60 Manchester Outer Ring Road was completed in 2000. A bunch of routes were thought up - one of which being a route between Strensham, where the M5 and M50 meet, and somewhere else to take traffic between the southwest and the East Midlands, Yorkshire and further afield. All seemed well, and the world was safe for democracy. Seemed? That doesn't sound very conclusive! Seemed is the operative world. A great big spanner was about to be thrown in the works, from a slightly unexpected source. Yes, you heard me correctly. Or more specifically, the Ministry of Agriculture, Fisheries and Food. MAFF kicked up an almighty fuss about the loss of agricultural land in the Vale of Evesham, and so Strensham - Solihull was dead. The Ministry was in a quandry. What to do? Clearly there was a need for a road in the corridor, and so the Midlands Road Construction Unit was sent back to the drawing board to think again. However, there were other dependant items planned too - specifically the aforementioned M42 and M69 that were ready to be built.. A decision was made that both could proceed - but on the strict understanding that only the sections that would be unaffected by any Strensham - Somewhere Else decision. Hence the sections of M42 round the east of Solihull, and the M69 between Coventry and Leicester proceeded, but in order to be ready for whatever happened next, both were built with an eye to being extended in the direction of Strensham. You mentioned that the Midlands RCU were sent back to the drawing board. They did indeed have another think, and in July 1972 Strensham - Solihull Motorway II (though disappointingly not subtitled "This Time It's Personal") was forwarded for consideration. Once again widening the M5 was rejected as being generally rubbish and expensive. Although the start and end points remained the same, the way to get between the two was quite different. This time the route chosen was more westerly than before. It was to pass west of Pershore and Alcester, and east of Redditch. This route had several advantages: it was cheaper in its own right, it served the New Town of Redditch more effectively, had less effect on existing development, and most importantly wouldn't annoy the Ministry of Agriculture too much. The documents were sent off to London, and the RCU held its collective breath. Well, firstly everyone turned blue, and once that happened they soon realised that the decision from London wasn't going to be a speedy one. So, they waited and waited, and then got a provisional "yes, maybe" back. The relief around the offices could be felt, as suddenly sales of fingernail plasters in Warwick dropped through the floor. Then the bomb landed - metaphorically, obviously. Oh? What was it this time? The oil crisis, what else? The Strensham - Solihull Motorway was one of the earliest casualties of the resultant cuts in Government spending, as it was pretty easy to kill off something that most people didn't realise was alive anyway. The fatal date was 6th February 1974, when Keith Speed, Parliamentary Under Secretary of State, Department of the Environment made an announcement in Parliament as an answer to a Written Question. Instead it was announced that the twice-rejected (rubbish and expensive...) widening of the M5 was to proceed instead. Eventually. However, that's not quite the end. In May 1977, "Strensham - Solihull Part III" (perhaps "The Return of the Evil Bad Guy"??) rose from the dead. Clearly there was no chance of there being a complete U-turn and the previous three-lane motorway resurrected. Instead the "Part III" report recommended a series of bypasses along the route, which would crash into a roundabout at Strensham rather than the previous nice free-flowing junctions. Needless to say, we're still waiting. Have you got a map showing the routes? Yes, thanks to David Brown, we've got maps of both Strensham - Solihull Motorway I and Strensham - Solihull Motorway II. It is accurate as far as route and junctions are concerned, and Strensham - Solihull Motorway II shows a Motorway Service Area at Defford. No decision was actually made to the site of the MSA, but three locations were considered: one at Defford as shown, one between the railway and the B4084 west of Pershore, and a third immediately to the north of Pershore Airfield north of Pinvin. Now what about that numbering conundrum? It's actually a little tricky working out what number it could have carried. At first glance, it could well have taken the M42 number all the way to Strensham, with the M40 number continuing west to M5. Unfortunately, M42 was already allocated to the section around the south of Birmingham as it does today, so that can be discounted. 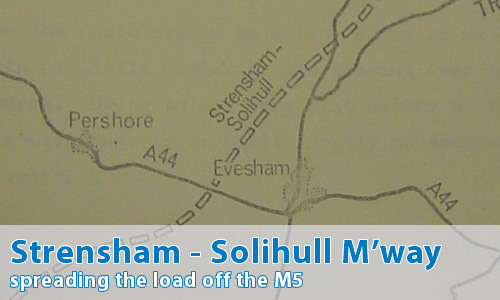 Another possibility was to take the M50 number from Strensham to Solihull. However, this causes problems too, as it would extend the M50 into the 4 zone for motorway numbering, and so it would break the numbering rules. Not only that, but the M50 junctions are numbered away from Strensham, so they would all need renumbering from the opposite end. At last some concrete information about this motorway - I had made a number of requests for information on S.A.B.R.E threads over the past few years (search "M50 Umberslade") but without any response. The project was referred to in the Birmingham Evening Mail on several occasions in the 1970's - Does this newspaper have a public archive section? I thought it was still being referred to as a motorway scheme until the LATE 1970's but perhaps I am mistaken. The main point I have to add is that the scheme was always referred to in the Birmingham Evening Mail as the 'M50 extension'. I also remember reading news about the Umberslade junction being redesigned when the scheme was scrapped. It's interesting to see how the junction could have looked.